The accounting cycle is the holistic process of recording and processing all financial transactions of a company, from when the transaction occurs, to its representation on the financial statementsThree Financial StatementsThe three financial statements are the income statement, the balance sheet, and the statement of cash flows. These three core statements are intricately linked to each other and this guide will explain how they all fit together. By following the steps below you'll be able to connect the three statements on your own., to closing the accounts. One of the main duties of a bookkeeperJobsBrowse job descriptions: requirements and skills for job postings in investment banking, equity research, treasury, FP&A, corporate finance, accounting and other areas of finance. These job descriptions have been compiled by taking the most common lists of skills, requirement, education, experience and other is to keep track of the full accounting cycle from start to finish. The cycle repeats itself every fiscal year as long as a company remains in business. 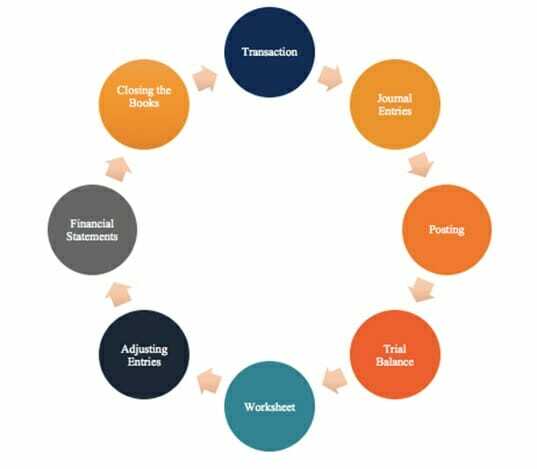 The accounting cycle incorporates all the accounts, journal entries, T accountsT Accounts GuideT Accounts are used in accounting to track debits and credits and prepare financial statements. This guide to T Accounts will give you examples of how they work and how to use them., debits and credits, adjusting entries over a full cycle. Transactions: Financial transactions start the process. If there are no financial transactions, there would be nothing to keep track of. Transactions may include a debt payoff, any purchases or acquisition of assets, sales revenue, or any expenses incurred. Journal EntriesJournal Entries GuideJournal Entries are the building blocks of accounting, from reporting to auditing journal entries (which consist of Debits and Credits). Without proper journal entries, companies’ financial statements would be inaccurate and a complete mess. : With the transactions set in place, the next step is to record these entries in the company’s journal in chronological order. In debiting one or more accounts and crediting one or more accounts, the debits and credits must always balance. Posting to the GL: The journal entries are then posted to the general ledger where a summary of all transactions to individual accounts can be seen. Trial Balance: At the end of the accounting period (which may be quarterly, monthly, or yearly depending on the company), a total balance is calculated for the accounts. Worksheet: When the debits and credits on the trial balance don’t match, the bookkeeper must look for errors and make corrective adjustments that are tracked on a worksheet. Adjusting EntriesAdjusting EntriesThis guide to adjusting entries covers deferred revenue, deferred expenses, accrued expenses, accrued revenues and other adjusting journal entries, examples: At the end of the company’s accounting period, adjusting entries must be posted to account for accruals and deferrals. Financial StatementsThree Financial StatementsThe three financial statements are the income statement, the balance sheet, and the statement of cash flows. These three core statements are intricately linked to each other and this guide will explain how they all fit together. By following the steps below you'll be able to connect the three statements on your own. : The balance sheet, income statement and cash flow statement can be prepared using the correct balances. Closing: The revenue and expense accounts are closed and zeroed out for the next accounting cycle. This is because revenue and expense accounts are income statement accounts, which show performance for a specific period. Balance sheet accounts are not closed because they show the company’s financial position at a certain point in time. The general ledger serves as the eyes and ears of bookkeepers and accountants and shows all financial transactions within a business. Essentially, it is a huge compilation of all transactions recorded on a specific document or an accounting software, which is the predominant method nowadays. For example, if you want to see the changes in cash levels over the course of the business and all their relevant transactions, you would look at the general ledger, which shows all the debits and credits of cash. To fully understand the accounting cycle, it’s important to have a solid understanding of the basic accounting principles. You’ll have to know about revenue recognitionRevenue RecognitionRevenue recognition is an accounting principle that outlines the specific conditions in which revenue is recognized. In theory, there is a wide range of potential points for which revenue can be recognized. Therefore, IFRS outlines the criteria for revenue recognition with customers. Conditions for Revenue Recognition (when a company can record sales revenue), the matching principleMatching PrincipleThe matching principle is an accounting concept where companies report expenses at the same time as the revenues they are related to. Revenues and expenses are matched on the income statement for a period of time (i.e. a year, quarter or month). Example of the matching principle Imagine that a company pays (matching expenses to revenues), and the accrual principleAccrualIn financial accounting or accrual accounting, accruals refer to the recording of revenues that a company may make, but it has yet to receive, or the expenses that it may incur on credit, but it has yet to pay. In simple terms, it is the adjustment of accumulated debts and credits. Such accounting practices, therefore,. These fundamental concepts will enable you to construct an income statement, balance sheet, and cash flow statement, which are the most important steps in the accounting cycle. To learn more, check out CFI’s free Accounting Fundamentals Course. Thanks for checking out CFI’s guide and overview of the accounting cycle. CFI is the official global provider of the Financial Modeling and Valuation Analyst (FMVA)™FMVA™ CertificationThe Financial Modeling & Valueation Analyst (FMVA)™ accreditation is a global standard for financial analysts that covers finance, accounting, financial modeling, valuation, budgeting, forecasting, presentations, and strategy. certification, designed to transform anyone into a world-class financial analyst.